Minerva Templeton has a reputation for being, well, something of a recluse. A wallflower, if you will. However, due to her grandfather’s demands, all that must change. She must travel to the wilds of Scotland to fetch a mysterious something. Minerva cannot fathom why she should be the one to have to bring home this object but if she does not, their grandfather’s fortune will go to a most underserving man. So off she sets to Scotland where she must brave all manner of awful things—things this wallflower avoids at all costs after a traumatic experience as a child. But after the death of her beloved Grandpapa, she cannot help wondering if she should be brave. Bolder. Try new things. Like meeting a handsome Scottish farmer turned wealthy landowner. Like falling desperately in love with the brooding, wonderful man? I enjoyed the fact that the Will’s stipulation for the beneficiary was carefully thought out to ensure compliance by the recipient. This book is the third instalment in The Inheritance Clause series. It is Lady Minerva Templeton's turn to for fill her Grandfather's wish to do a task stated in a letter left by her Grandfather so she can inherent from his estate. Mine has to travel to Scotland to retrieve an item and return to show the lawyer to show that her task is completed. This may sound a very easy task but Lady Minerva has many great fears as she suffer from PTSD as she was kidnapped for a ransom when she was a child and finds it very difficult to travel anywhere. Her grafter has stated in her letter that she must take this journey to try to conquer her fears. So with her maid and a footman and coachman the journey begins. The adventure she has along the way to Scotland is a great story and the Hero she meets is a very handsome kind and is just right for Minerva. This book can be read as a stand alone but urge the reader to read the first two books in the series as they will enhance the knowledge and give the reader more great books by this author. I highly recommend this book. I received a free copy of this book via Booksprout and am voluntarily leaving a review. The family gathered to hear the lawyer’s reading of their grandfather’s Will. The house would go to the grandchildren‘s mother – since grandfather had no sons. She would also receive an annual allowance of money. The grandchildren themselves would inherit the rest of his large fortune -- but only if they fulfilled certain terms and within a period of two months. If they failed at their tasks, the money would go to Mr. Hastings, a beast of a man who dishonored their cousin and ran off with a nursemaid! No one felt he deserved any money at all, which is what compelled each of them to take this seriously! Minerva had been kidnapped as a child, and consequently she was timid and afraid of everything. She knew she had to overcome this fear that ruled her life. Her letter directly impacted those fears! She must travel to Scotland to collect something that belonged to her grandfather! She could not venture out to the next county – how would she travel far away to Scotland?? Minerva kept a smile frozen on her lips – but she could see that no one there believed this didn’t terrify her. In the morning she woke in a strange inn, afraid to open her eyes. She took a deep breath, and saw the sunlight coming through the window. She relaxed and smiled, knowing how proud her family would be that she had made it this far. She met other people and they were courteous and friendly, not what she had always feared. Her grandfather had wanted her to summon the courage to live a proper life. He was right, and she was starting to understand. As her maid helped her dress, she noticed Mary was sweating and held her stomach briefly. Was she ill? As they continued their travel, Mary was not doing well. Minerva asked the driver to stop at a farmhouse since they would not make it to the inn for some time and Mary needed rest now. Lachlan Sinclair was annoyed at the knocking on his door. But when he told him of the problem, he carried Mary inside. He asked the groom to take one of his horses and get the doctor. He tended his stock and returned to make a meal for them. Minerva felt very comfortable in the farmhouse. She also felt comfortable around Lachlan. There was a stillness about him that put her at ease. Yet his eyes took in everything that was happening; he would be a fine protector, she knew. She helped him dry the dinner bowls. As one slipped from her hands, they both caught it, his hands covering hers. She was breathless and had never felt like this. She was very much aware of him! When she asked, he told her he was not actually a farmer. He owned all of the surrounding lands and, while his tenant’s family was travelling, he had offered to take care of the farm and animals. But he seemed very comfortable no matter what he did. Although he missed the luxurious fabrics of his finer clothes, he did not miss wearing the cravat and breeches every day, nor did he miss being surrounded by servants. Mary was recovering, but still weak. Lachlan told Minerva what he had thought of – that Mr. Johnson could take his place working the farm and caring for Mary. Lachlan would go with Minerva since the rest of the trip was by horseback and he thoroughly knew the area. She gladly accepted! But as they were getting ready, Mr. Johnson told her Mr. Young was now ill. He offered caring for them both – and she should go with Lachlan and complete her task. He said he knew how honorable she was, and what her family didn’t know would not hurt them. How would Lachlan feel about it? Would they safely get to the cottage and retrieve her grandfather’s item? Would there be danger to face? Or was the only danger losing her heart over the gentle Scotsman who meant so much to her already? This is such a wonderful series, and I think this is my absolute favorite! Each has started out full of pre-conceived notions that would be completely turned around as each person grew and matured within the experiences provided to them. It was such a joy seeing how each character handled their challenge. Join in the fun of this wonderful story and see the wisdom of their grandfather in the tasks he set before his grandchildren to put them on the right course in life. I must have been distracted as I was not aware of this release, one I wanted to read as I follow this series. So here it is about Minerva’s task to fulfill her grandfather’s will. I do not know if her grandfather was a kind of magician but each of his demands brings love in the life of his grandchildren. Minerva’s obligation was more about letting the past go than doing something. Since a traumatic event as a child, she buried herself in her London’s home, never leaving town and going out only when she felt it was safe. So going all the way to Scotland is her grandfather’s way to free her from her fears. Lachlan never expected, when he offered his help to take care of one of his tenant’s farm, to encounter an English lass, one so pretty he can’t comprehend she is still single and what is she doing there. And for being from the Gentry, she is no haughty person and she cares even for those under her station. During the short time they get to know each other, they came to care for another and conquer their fears or griefs. It was a sweet and enjoyable story of two peoples a bit lost among their world, needing each other to see what they missed really. A 4.5 stars rate for this cute novella. The Templetons, Minerva, Angel, Seth, and Theo are all attending the reading of their grandfather's will. They need the money, but they all must successfully perform a specific task in order to inherit. In books 1 and 2, we read about Angel and Seth, now it's Minerva's turn. I think it's brilliant that all four books happen concurrently, because at least the first three books can be read in any order. Poor Minerva! After a traumatic experience fifteen years ago, she has been scared of everything. She is existing, not living; the spark has gone out of her. 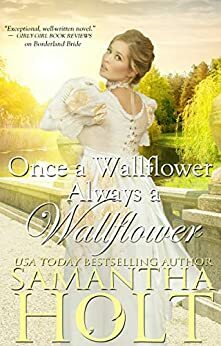 She has willed herself to remain a wallflower, but her task will change all that if she can do it. She is to retrieve a mysterious object in Scotland, where she has never been; and as scared as she is at first, soon the adventurous child resurfaces. She leaves, accompanied by her lady's maid Mary, but along the way, they are forced to stop at a farm. They are greeted by Lachlan Sinclair, whom Minerva at first mistakes for a mere farmer. He is big, she should be afraid, but Lachlan is kindness personified. And so begins the romance Minerva never thought she would ever experience. Minerva and Lachlan are such adorable characters, and they have great chemistry. ONCE A WALLFLOWER, ALWAYS A WALLFLOWER is a very sweet romance with a little bit of steam. I loved how the romance progressed, it was cute and believable. The writing is lovely, it's pleasant, and so easy to read. There was just a tiny detail that puzzled me because it was inconsistent with the premise for the inheritance. I wondered if it would be addressed at some point, but it wasn't. I love that the books are short and that they are published quickly, so I don't have to wait too long. My favourite book of the series remains Seth's, but I cannot wait for the conclusion with Theo's story! 5.0 out of 5 starsI love this book series! Samantha Holt writes delightful historical romances, and her Inheritance series is among the best of her work. In each of these novels, one of the four Templeton siblings must complete a difficult task in order for any of the siblings to inherit from their late grandfather. The tasks are designed to help each sibling overcome a particular character flaw/fear, and their efforts to do so are both believable and highly entertaining. This third novel in the series is no exception, and the reader cannot help but adore shy and agoraphobic Minerva Templeton, who overcomes her traumatic past, develops her personal courage, and embraces love. This beautiful story is well worth a click!